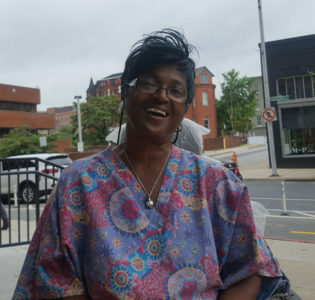 A Success Story – Cindy Willingham | Service Coordination, Inc.
Cynthia (Cindy) Willingham is 57-year-old resident of Mt. Vernon in Baltimore City. Cindy takes pride in growing up as a resident of Baltimore City and has spent her entire life there. Cindy’s has a close-knit family and they are very important to her. Her family members reside within a few miles of each other in the Baltimore City area. Cindy is the proud grandmother to seven lovely grandchildren ranging in ages from 6 to 21 years old. She enjoys spending time with her grandkids as much as possible. Cindy loves her grandchildren and they are very helpful to her by running errands and keeping her company. She is encouraged and inspired by her family. Cindy’s love for her grandchildren is part of the reason why she pushes herself day-to-day. In 2008, Cindy was diagnosed with a blood clot in her spine. As a result, she was paralyzed for about two and a half months. Cindy had surgery on her neck vertebrae in 2008 and again in 2009. This corrected some of her medical issues, but she has not regained full functionality on her left side. Following the initial surgery, Cindy found her apartment in Mt. Vernon to be too small as she came home to recover. The entry way of the apartment was less than 10 feet from the hospital bed where Cindy rested. Cindy is able to advocate well for herself and was able to do so even while attempting to overcome the challenge of becoming partially paralyzed. While recovering from surgery, Cindy worked diligently with her primary doctor and the apartment complex where she resided to obtain a larger apartment, as well a power chair to increase her mobility. In addition to needing a larger apartment to accommodate her own needs, Cindy had the needs of her family in mind. She made it a priority to have enough space for her grandchildren to come to her home on occasion for sleepovers. Her goal was to recover enough to be able to cook pancakes for them for breakfast. This motivated Cindy to work hard to get better. Securing a larger apartment and learning to use her new power chair helped Cindy to meet these important life goals. Despite overcoming these particular challenges, she was still finding it difficult to meet her ADL needs on a regular basis. At that time, the Social Worker in her building stepped in to help and made a referral to the Community First Choice (CFC) program. Supports Planner Supervisor, Dan Mathwin, was assigned to assist Cindy and he got to work right away.